In our earlier PodUniversal Edition 96, we had published a freewheeling conversation with Dr K C Chakrabarty, Deputy Governor of Reserve Bank of India on Education Loan Schemes in India. In his interview, Dr Chakrabarty had suggested an "Insurance Scheme" to be introduced by Government of India to encourage Bankers to provide more education loans to deserving students. He has also assured that no deserving student should be denied education opportunity. Based on the interview with the Deputy Governor of Reserve Bank of India, we spoke over mobile to Mr T K Rangarajan, Member of Parliament, Rajya Sabha (representing CPI M). 4. Though, he has not made up his mind about separate outfit for education loan, he suggested a separate exclusive branch / department by all the banks to focus on education loan to deserving students. 3. He has also assured to take up in Rajya Sabha and with Hon'ble Finance Minister during Budget Session to improve the Education Loan Schemes and to ensure that more number of deserving students get the assistance from Banks. India Vision Group will be discussing further with Mr T K Rangarajan MP, to facilitate him to take up in Parliament. Please listen to the Feature on Education Loan, including the itnerview with Mr T K Rangarajan, by clicking the 'play' button in the flash player below ( 7 minutes). The streaming of the audio will be smooth in broadband connections. If you find any streaming difficulty, you may right click this link and save target/link to your desktop to download the audio in mp3 format (6 mb). 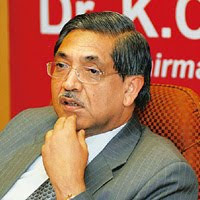 The audio podcast may also be listened from the following links"
"No deserving student in India should be deprived of higher education, for want of funds", - Dr K C Chakrabarty, Deputy Governor of Reserve Bank of India assured the Indian students, in an exclusive podcast interview taken on behalf of India Vision Group and Action 2020 Team. India Vision Group has been taking up periodically important issues of common concern with respective higher Authorities with a positive approach to find out best possible solutions. In the recent days, we have been receiving lot of grievances from various 'voiceless' people that they could not pursue higher education for want of funds. One one side, it is reported that if the students are hailing from poor families, the Banks do not consider them worthy of education loans, however brilliant they are. They are asked to run pillar to post. ; They are being asked to provide collateral security even for small amounts, etc. On the other side, due to privatisation of education, the cost of education has also gone up which could not be afforded by these poor and intelligent students. There are many instances, where such brilliant students end up their ambitions by joining some menial jobs. This century is considered as Knowledge Century and the country is losing many people who could have otherwise become great scholars and scientists, technocrats. Do the poor but intelligent not have any space in the world to pursue their ambition? This question lingers in the minds of many people. With this question, we approached Dr K C Chakrabarty, Deputy Governor, Reserve Bank of India to find some reasonable solution for this issue. He was highly pro-active in his approach. He assured that no deserving student should be deprived of higher education in India for want of funds. Since, he himself, a Gold Medalist in his student days and an academician and researcher in his earlier days, before joining the Banking Industry, he could visualise how 'Knowledge society' can play a greater role in taking India forward. He has also nominated a Nodal Officer for the purpose of Education Loan at the Central Office of the Reserve Bank of India. The Nodal Officer is Shi B.P.Vijayendra, CGM, RPCD. His e-mail id is bpvijayendra@rbi.org.in and contact number is 022 22610261. Jan 2010 issue of Corporate ezine PR-e-Sense will be exclusively dealing with Education Loan Scheme. We will also publish the Model Scheme circulated by IBA, various views, responsibility of the Bankers and borrowing students, etc. You may download the ezine from www.corpezine.com in the third week of Jan 2010. We are trying to make this as a guide to students and parents who are aspiring for Education Loan for higher education. PodUniversal. India Vision Group and Action 2020 Team place on record the sincere appreciation to the Senior Officials of RBI, Mr G Jagan Mohan Rao (Chief General Manager, Customer Relations), Mr B P Vijayendra (CGM, RPCD) and Dr K C Chakrabarty (Deputy Governor) for being pro-active and coming forward to resolve the issues with a positive mind. Three Cheers to them. Please listen to the podcast interview with Dr K C Chakrabarty (18 minutes), by clicking play button in the flash player below. The audio streaming will be smooth in broadband connections. If the streaming is not smooth, you may right click this link and save the link/target in your desktop and download the mp3 format.